Who is Team Missing Spokes? We have a short but powerful history as a friends and family Willamette Valley Bike MS team. In 2013, Mike and Sheila Mawdsley decided to start a team to raise money to fight multiple sclerosis. Five friends rode amidst the beautiful scenery and raised $3100. In 2014, we climbed to 10 people and $10,000 in fundraising and added sponsor Pure Life Clinic to provide team jerseys. We kept growing and in 2015, we had 24 riders and raised just over $24,000! Not stopping, in 2016, 26 riders came together to raise just shy of $30,000. Our Five-year anniversary was an amazing year with 36 riders and $42,000+ in fundraising. But, we didn't stop there! In 2018, 35 team members raised $50,000! We also had numerous Sponsors join our efforts. As you can see, we are a growing team, passionate about having fun and raising money to fight MS, restore lost function, and support those living with the disease. 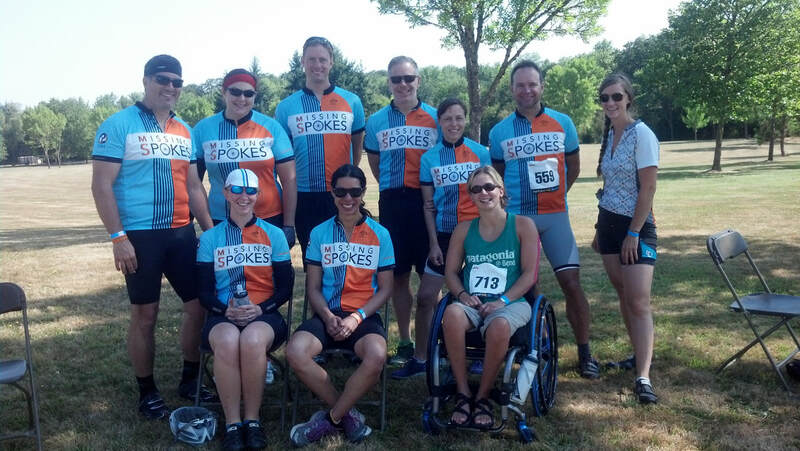 In 2008, Sheila, the co-captain of team Missing Spokes, was diagnosed with MS. She and her husband, Mike, weren't planning on just sitting around waiting for a cure to materialize. They were inspired to pull a few friends together and raise money to support the research efforts. They quickly experienced, as most participants do, the community ​of Bike MS to be inspiring and welcoming. They fundraise because the money they raise is funding advances in understanding the complex symptoms of MS and creating breakthroughs in treatments. To date, Bike MS has raised more than 1 billion dollars toward changing the impact of MS on the lives of the over 2.5 million people worldwide who have been diagnosed with this unpredictable disease. Where and when is Bike MS? Bike MS Willamette Valley is always the first weekend in August. This year Bike MS is held August 2, 3, and 4, 2019. We meet at Western OR University in Monmouth, OR and ride through the rural beauty of the Pacific Northwest! Our team meets in Rider Village in our team tent (earned with $20k in fundraising dollars) on Friday evening to celebrate the successes of our team. Kick off the weekend by getting to know other team members you haven't yet met and enjoy a complementary pint of beer or glass of wine with old friends! There are many routes to choose from so find some friends to ride with and head on out on Saturday morning. There's lots to do when you return to Rider's Village, including free massage for top fundraisers. There is a wonderful program on Saturday night that you won't want to miss. Another thing not to miss is the MS Victory Loop. A one-mile ride to kick off Sunday morning, riders with MS and of all abilities take the MS Victory Loop while friends and family cheer them along the route. It's a emotional and inspiring reminder of why we ride and fundraise. Choose your Sunday route and head out for another glorious day of cycling before heading home, tired and rewarded knowing you are helping to end MS forever!